Each quilt will be examined carefully. The completed appraisal, along with a photograph, will be mailed to the client within two to three weeks. Suggestions for use and care will also be given. A written appraisal is done for insurance replacement value, donation value or market value. These values are researched in the current market. A verbal consultation is given for dating and care only. An estimate of value may be given. 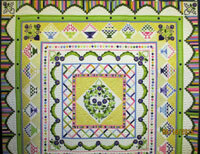 Discounts are given for collections of over 10 quilts. What would happen if your quilt was damaged, stolen or lost? Would you be able to replace it with one of comparable value? Without a written appraisal and a photograph, insurance companies often consider a quilt as bedding and will only replace it with one of department store quality (usually poorer quality). If dating of and how to care for your quilt are the only questions you have, a verbal consultation may be appropriate. An estimate range of value can be given for this consultation for antique quilts. 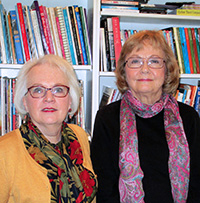 Dee Dadik and Molly Butler have over 4 decades of quilting and appraisal experience to help you enhance the enjoyment of your quilts, know their value, and take care of them. They have taken classes in dating, construction, appraising, legal issues, ethics, care, preservation, social history, textile history and regional differences. They participate in continuing education including updating classes with the National Uniform Standards of Professional Appraisal Practices (USPAP), independent study and numerous activities that keep them aware of current market conditions. These experiences plus an extensive library of references help them to appraise your quilts and give you a much greater appreciation and understanding of what you own.